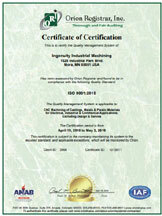 Ingenuity Industrial Machining is an ISO9001:2008 Certified company. We use the most up to date quality equipment and processes to meet our customer's quality requirements. Ingenuity Industiral Machining will ensure that your parts conform to all applicable specifications and provide a comfort level that earns your trust. Providing products that comply with specified performance standards, reliability, workmanship, price and delivery. Continually improve the quality management system effectiveness through established reviews. Supply employees with training and resources to excel at satisfying customer needs. Establish and maintain partnerships with suppliers and customers to provide mutual benefit. 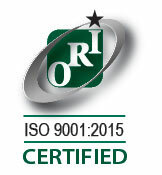 Commitment to quality excellence is each employee's responsibility to meet internal or external requirements. BROWN & SHARPE DFX Coordinate Measuring Machine with X 18", Y20", Z16" travel. Brown & Sharpe(2012)Global Classic 7101 Coordinate Measuring Machine with 27.6 X 39.4 X 26.0 Travel. FaroArm (platinum) Portable CMM with 4 ft. measuring range. CAM2 measuring software. DELTRONIC DH-14" MPC Optical Comparator with microprocessor, 10X lens and electronic probe. SURFOMETER system 1 surface roughness measuring system. MITUTOYO Bore Gage 1.4" to 24.0"
MITUTOYO Digimatic bore gage system range .05" - 2.0"
MITUTOYO digital bench mic 0" - 1"
Micrometer set 0" to 24"